There's no bench pin more versatile than this one. The Multi Use Bench Pin includes the traditional V-slot in front but also features a slotted extension for supporting rings while sawing. Additionally, there's a side V-slot and two trays milled into the wood to hold your burs. 8-1/8" long overall x 2-1/4" wide. 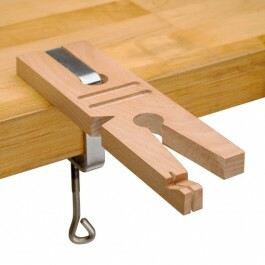 Furnished with steel clamp that accommodates bench tops up to 2" thick. Made in India.